“Is it original?” is a question often heard in origami circles. We all want our latest creation to be a quantum leap in origami design, but what are the chances? For many long years, Brilly, Wayne and I have debated the eternal question “is the golden age of origami over?” The two concepts are interlinked – if most of the “good” designs have already been discovered, there’s less opportunity for newcomers to find original ideas. It’s certainly true that starting from a bird base, you’re highly unlikely to derive something radically new. The same probably applies to all the common bases, although I feel in my bones that the fish base may have more to offer. 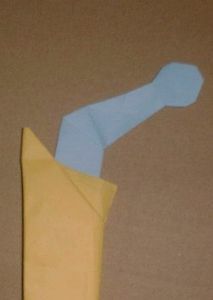 However, the longer I live and breath origami, the less often I see something I consider to be revolutionary. The tenancy to become jaded is all too common amongst experienced folders. Even the super-complex designs, whilst mind-blowing in their execution, can seemingly be broken down to crease patterns that an experienced folder can refold without diagrams! Over the years, we’ve had creative explosions in new areas, such as modular, twist, golden (cough) venture. The Jackson “crumple” technique was dismissed by many as “not origami”, but Vincent Floderer has comprehensively blown that judgment out of the water by utilising origami techniques in his amazing organic folds. Giang Dinh is another who has a style all his own. Originality in a design isn’t based solely on folding technique, but also on that vague concept of “character”. Giles Towning is a good example. Whilst his designs may not offer radically new techniques, he has a clear vision of what to fold and in doing so, stamps his personality onto his work. Edwin Corrie is another whose work can generally be recognised without a name-tag. So perhaps today’s creators should be working on character as much as technique. How might they achieve this? Perhaps by looking at an area of their life that specialise in – Stephen O’Hanlon (a surgeon) has come up with various medical-themed ideas (see his hip replacement) alongside plenty of other impressive work. Vincent Floderer turned to his love of mushrooms (he’s a fun guy) to inspire new creations. It’s also important to try and focus on your own perception of origami and not to worry too much about other people’s reactions. Only you can decide when a model is complete and I often find it difficult to decide whether to add an extra step to further “refine” the result. I think there’s a point in any given model when it has reached perfection, not necessarily in terms of “all points present”, but at a more personal level. Some people go past that point, so don’t quite reach it.